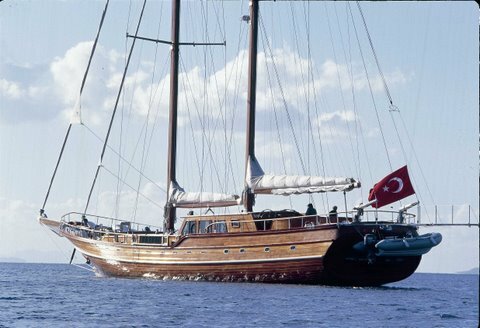 Sailing yacht Eylul Deniz II (or ED II for short) is a 30m ketch gullet with wooden hull designed and built by East Yachting and launched in 2005. 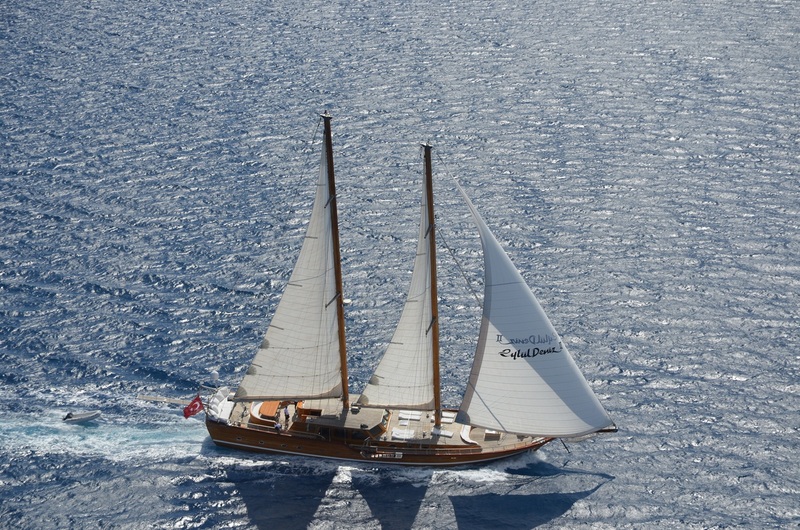 A flagship of classical luxury yachts in Bodrum, yacht Eylul Deniz II available for yacht charters in Mediterranean and Aegean seas. 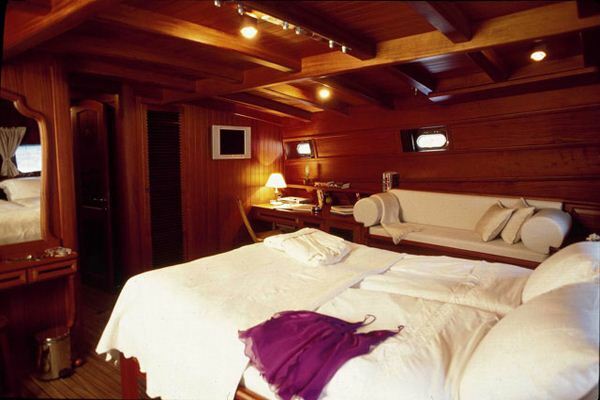 She can accommodate up to 8 guests in 2 double masters and 2 twin guests rooms. 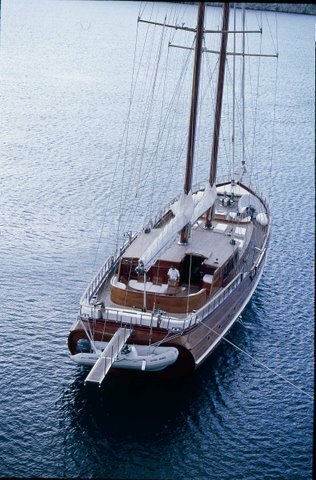 S/Y ED II has elegantly curved traditional lines with a unique aft shape, pleasingly proportioned for a refined style of sail. 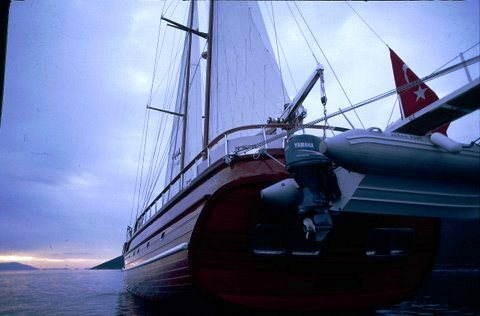 The high quality of craftsmanship and engineering on board demonstrates a balance between traditional excellence and cutting edge technology and optimal performance and stability. 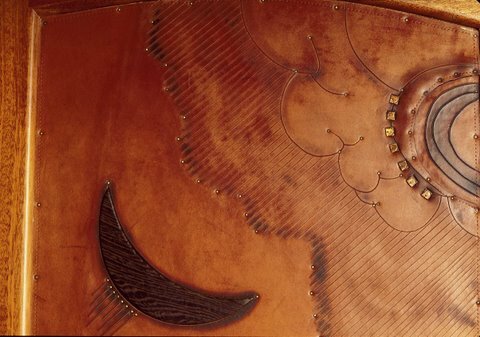 Eylul Deniz II’s interior provides proof of her quality of craftsmanship in every detail, the epitome of marrying teak, mahogany and stainless steel and astonishing art pieces in carved leather create the essence of luxury and sophistication. 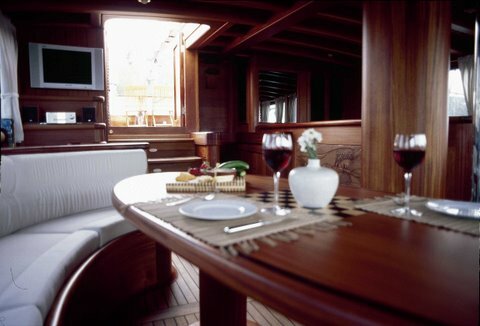 Her Main Salon has access from the aft deck featuring a bar, a dining table and a sitting area as well as the secondary control deck. 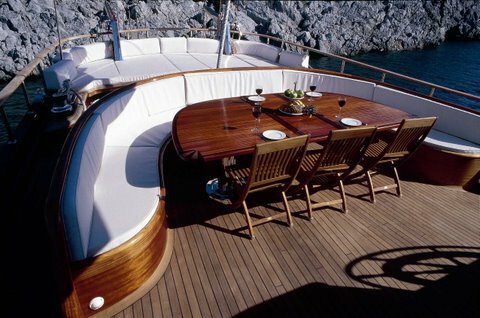 The rounded classical curves and soothing textures of the yacht are also distinguished in her interior details with tribute to nature and the sea. 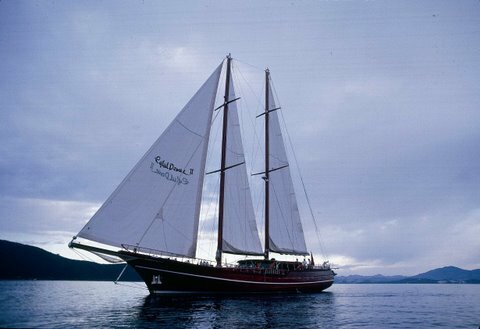 Gulet ED II is able to accommodate up to 8 charter guests in four cabins located on the lower deck. 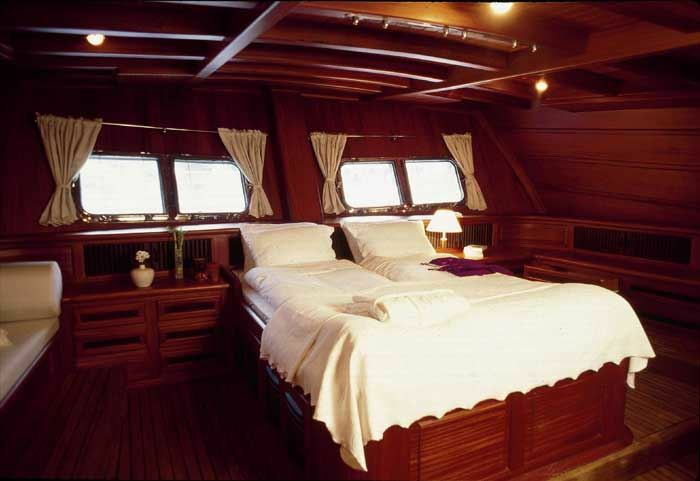 The owner master cabin is at the aft of yacht featuring a king size bed and accentuated wood and leather works that contrast with the natural light streaming in from the large windows. 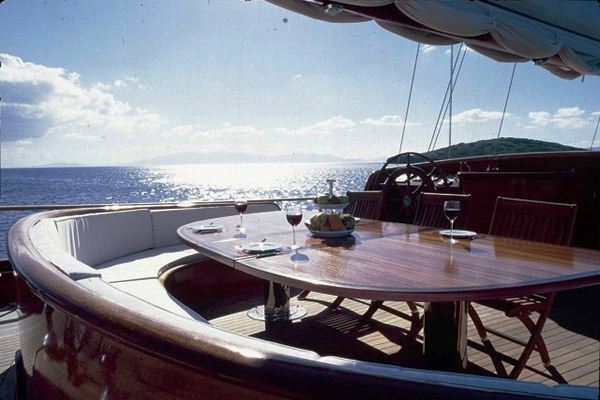 The Fore master cabin and two twin guests’ cabins offer conviviality and serenity. The en suite bathrooms feature marble and wood finishes blending relaxation and comfort. 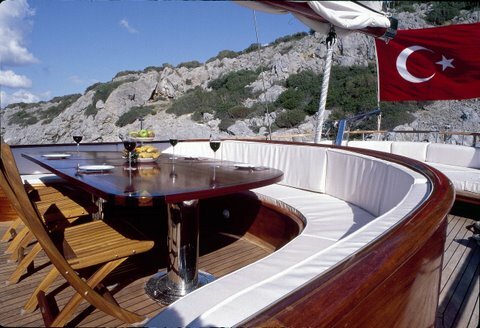 The ED II charter yacht features an array of sunning areas, an external dining table and sunbeds on the aft and front decks offering the spaces for entertainment, relaxation and the experience of tasting Turkish and International haute cuisine. 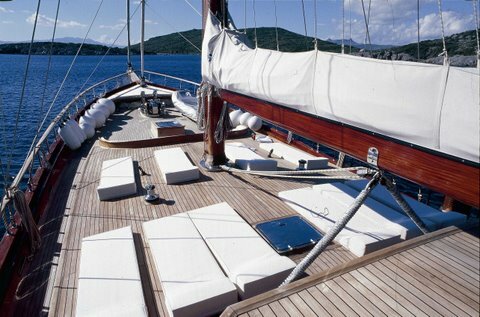 Sailing yacht ED II holds the BV Hull Mach, Charter Yacht, W, Unrestricted Navigation classification as one of the pioneer within her peers. 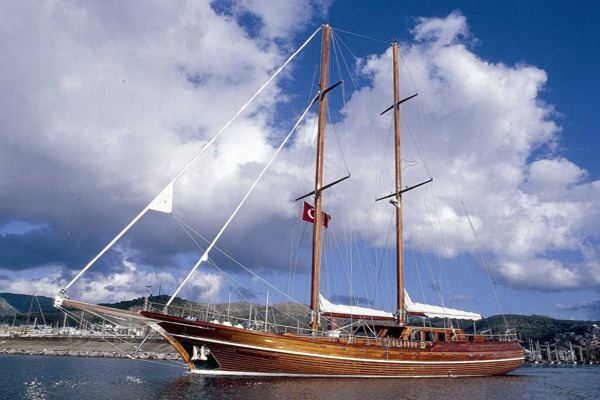 One of the best organized silver service crew of five has worked as a team for many years and is loyal to the Eylul Deniz II Gulet all year long. 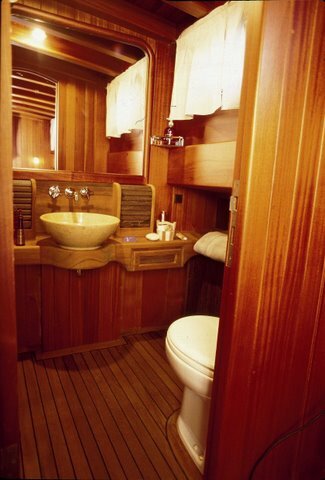 The crew has three cabins and their living area for their own interior privacy. 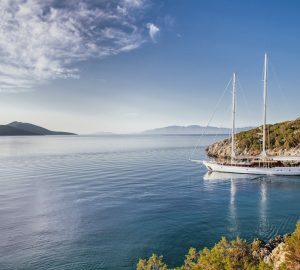 ED II hosts her guests from early spring to late autumn along the outstanding coastline of Mediterranean and Aegean seas with her footprint in excellence in service. 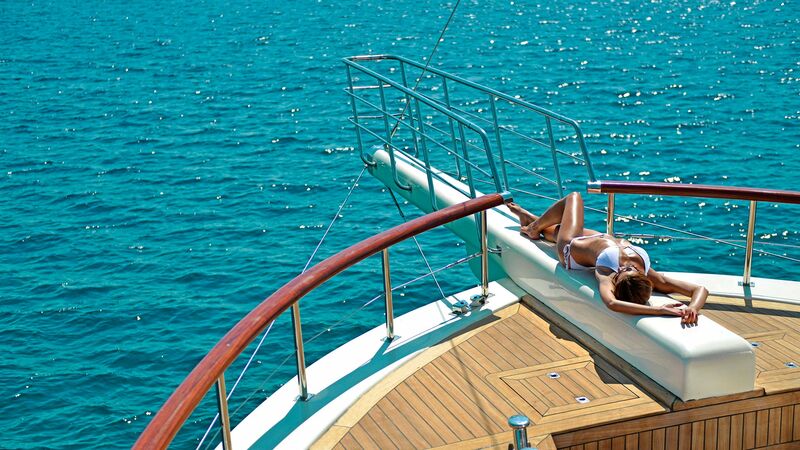 Luxury yacht Eylul Deniz II provides charter accommodation arrangement up to 8 guests in 2 master bedrooms and 2 guest rooms in the lower deck. 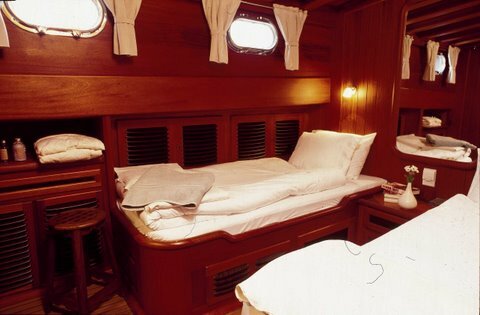 The aft and fore master cabins have king size beds, spa pools embedded in their bathrooms and separate dressing and working areas. 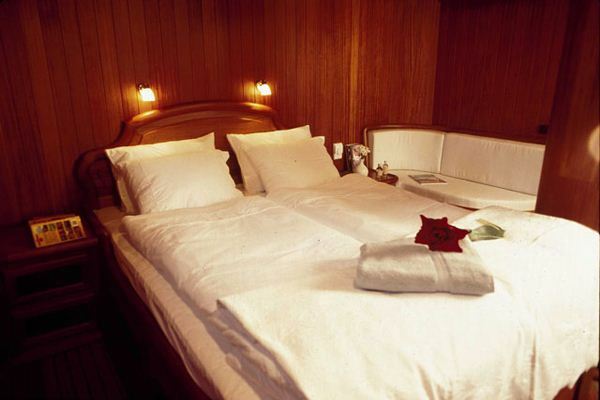 The guest rooms have 2 single beds in each. All the guest and master suits have expansive portholes and daylight with full en suite bathroom facilities, climate control, mood lighting, music systems and TV with DVD players. 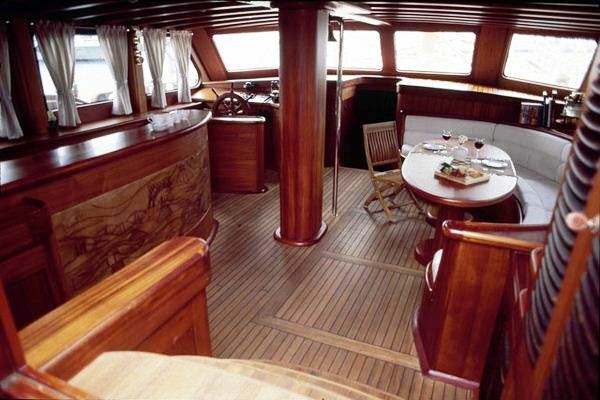 She has a separate crew accommodation for six with bathrooms and living areas. 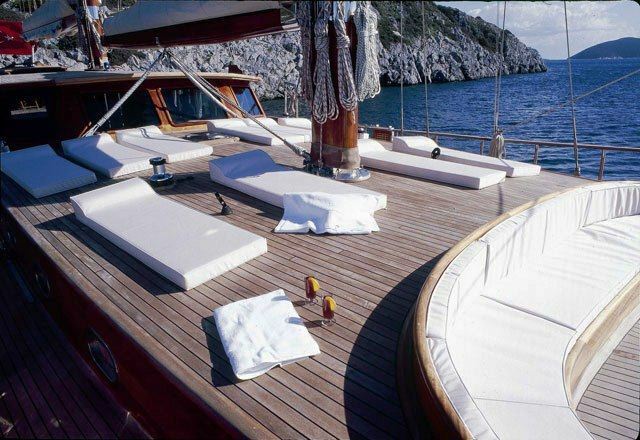 Amenities and extras onboard the charter yacht Eylul Deniz II (EDII) includes a Speed boat with 60 HP Yamaha, water ski, wind surf, kneeboard, Ringo, canoe, skin diving, fishing equipment’s, barbeque, wireless connection, high definition TV & DVD, DVD library, Hi-Fi sound system (saloon and cabins), cooking classes. Navigation & Communication equipment includes Radar (Simrad), GPS (Simrad), Depth rounder (Simrad), Wind speed (Simrad), Auto Pilot (Simrad), Navtex, VHF radio/telephone, Internet, Satellite, TV, CD, DVD, DVX players (in all cabins and living areas). Galley & Laundry: Fully equipped electrical kitchen (Gaganeau), Refrigerators, Deep freezer, Ice maker, Washing machine with dryer.